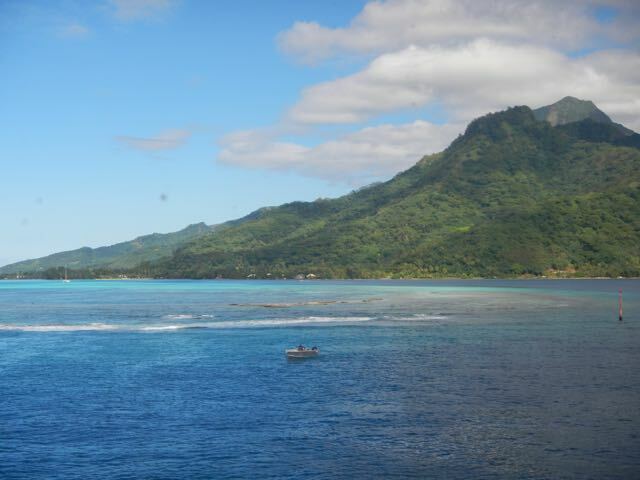 Conni's brainstorm of riding the ferry to Moorea was one of those spur-of-the-moment ventures that exceed all reasonable expectations. 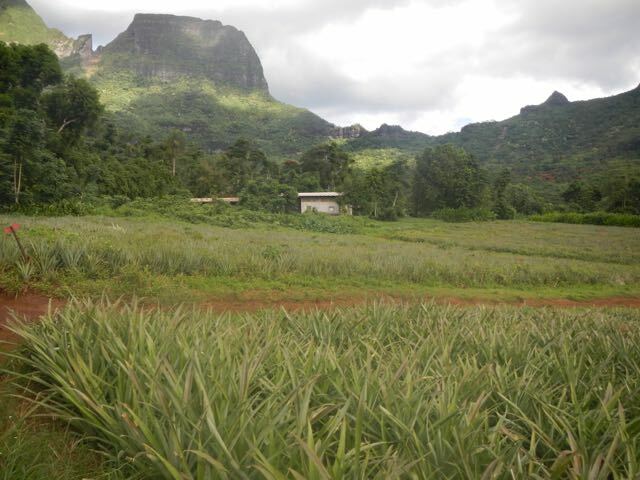 At great expense, we rented a car and had ample time to drive completely around the island, stopping where we would and seeing what there was to see. What a day! 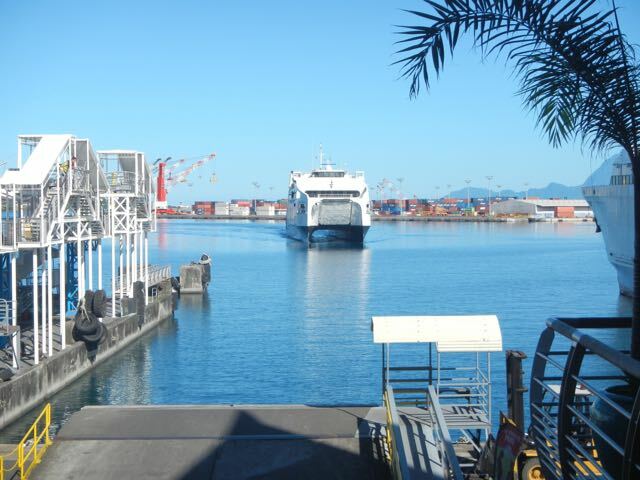 Aramiti 2 approaches the dock. The "iti" ending means "small" while "nui" means large. 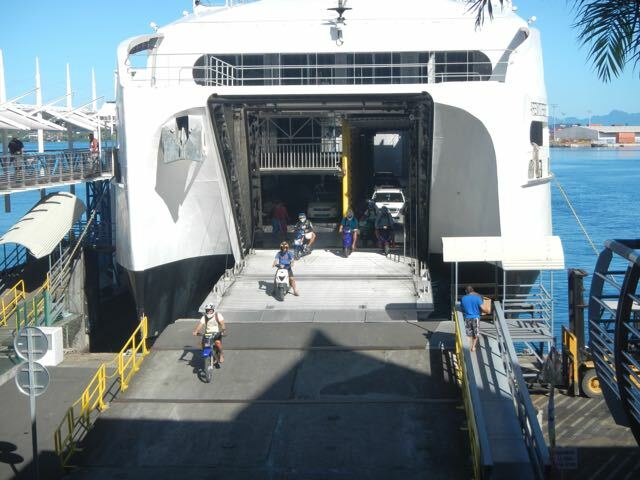 And begins to disgorge her load of passengers and vehicles. 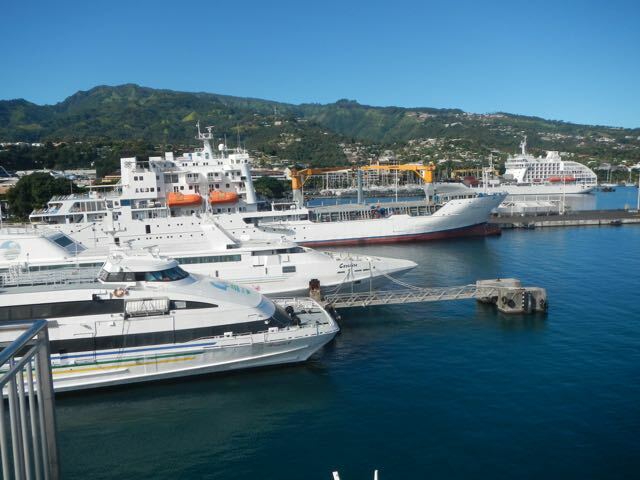 Every vessel in this photo is a ferry and all are heavily used. 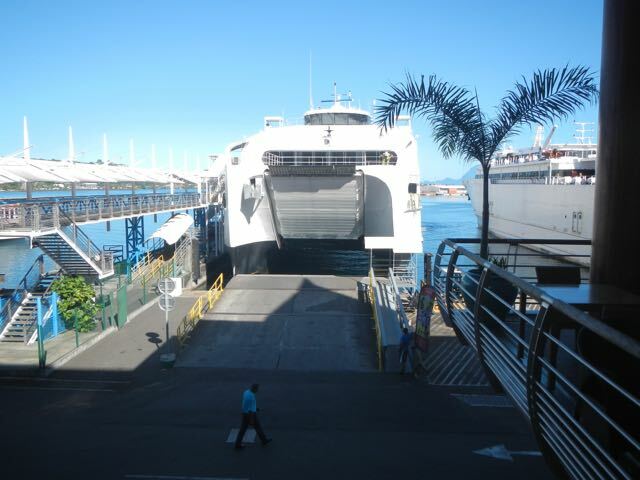 When one lives in an archipelago of islands, ferries are the local buses. 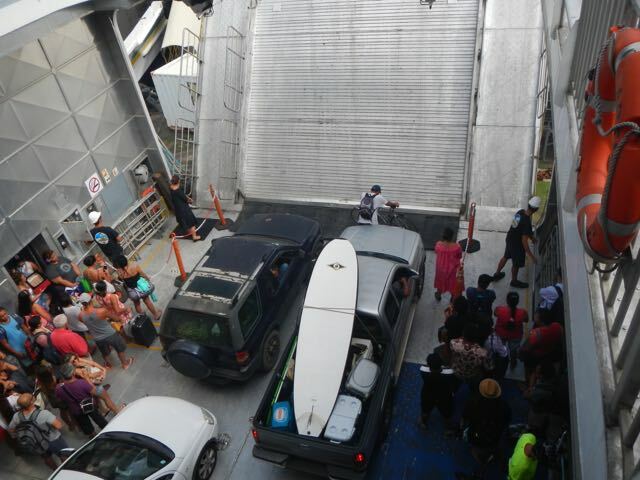 I ran to the upper deck as the ferry departed and snapped this photo of the energetic crowd that congregated there. Young people were talking, laughing, playing music, and sharing food. What a scene! 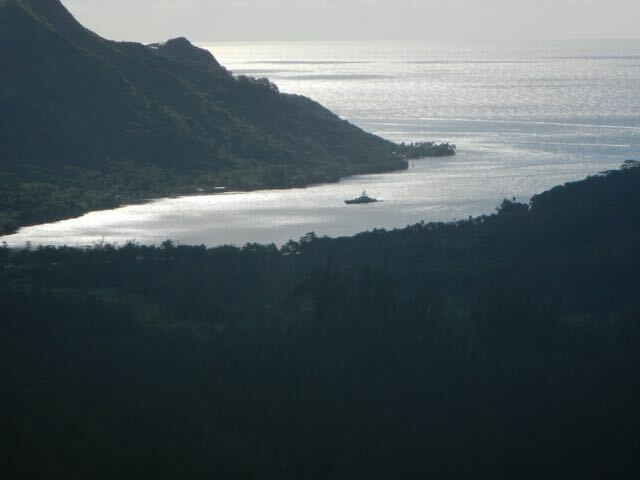 The vessel in the foreground is a traditional double-hulled sailing canoe, and behind is a half-passenger/half-cargo vessel for the local trade. 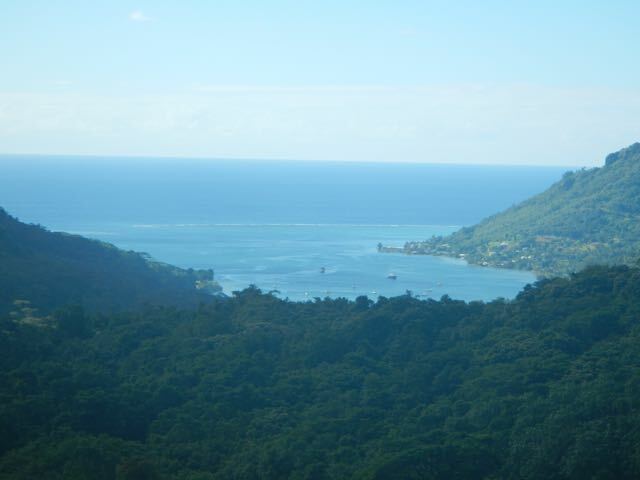 Taken from the top deck of Aramiti 2. Wings! 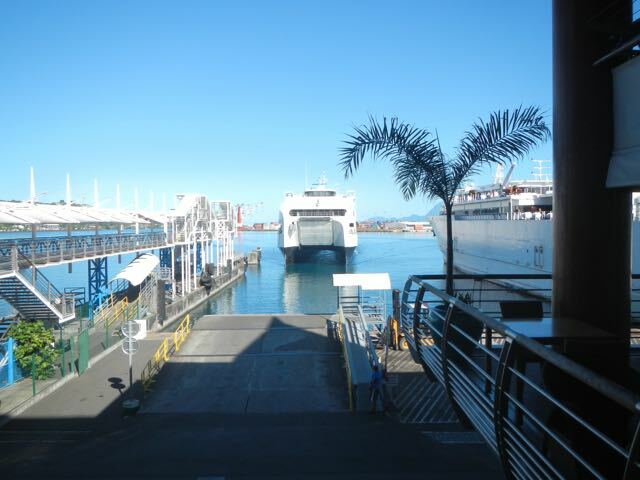 Here she is, second from the right-most boat. 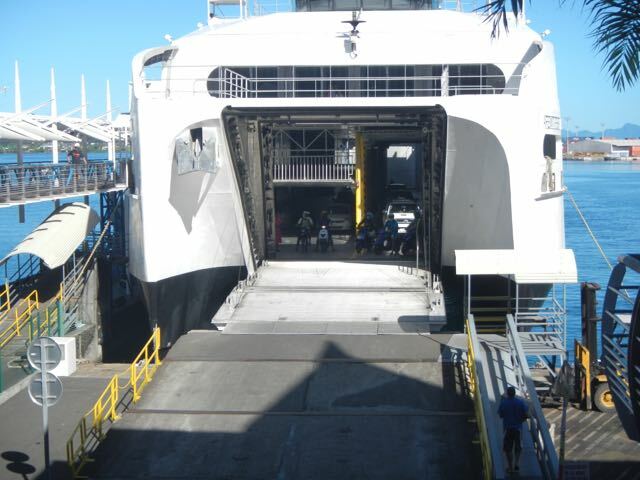 She's tiny compared to the 60-footer off her bow. The lovely park that we've mentioned is all along the coast. It's easy to see why waves might jostle Wings in this location. Each night, we hear drumming and singing from the huge crowds in the stadium. It's right on the water's edge. 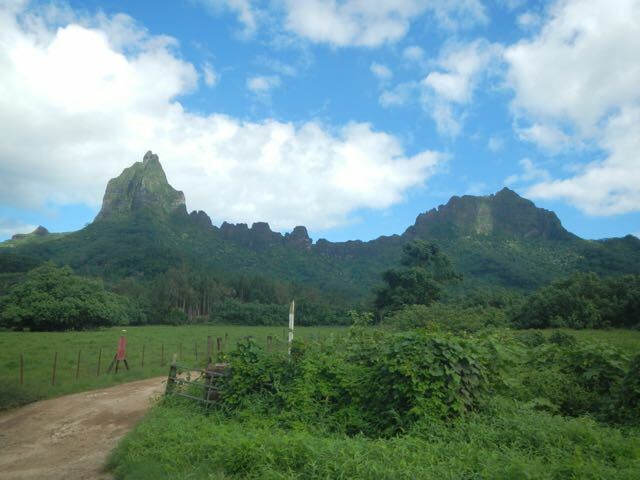 The entrance to Moorea's Vaiare lagoon, site of the ferry's terminal. 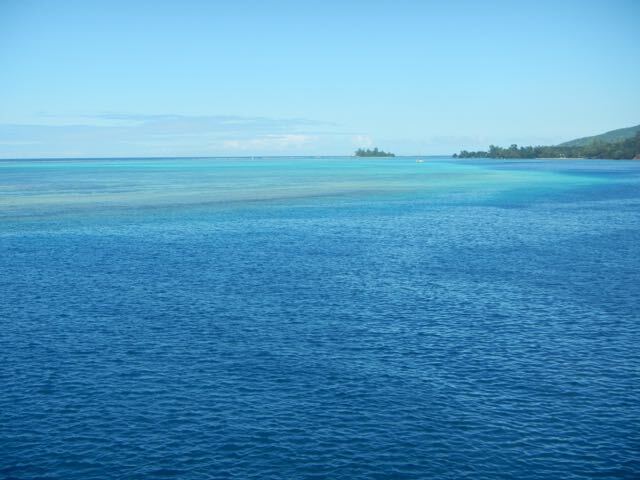 The water over those deadly reefs is beautiful. From just inside the reef, it looks inviting, but not to boaters. It's very shallow and many vessels have been lost on it. 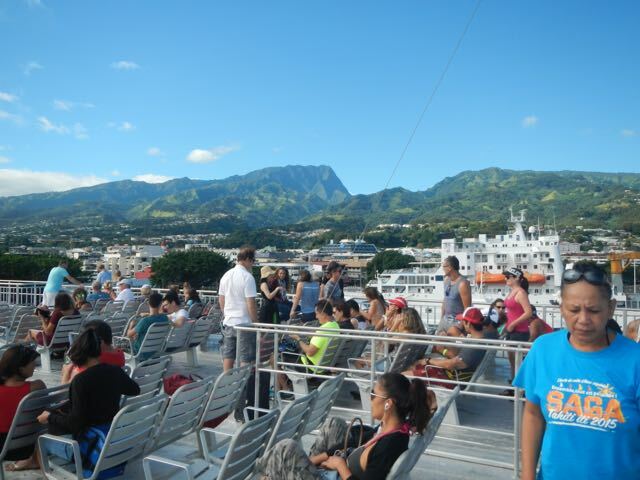 We look down on the crowds anxiously awaiting disembarkment in Vaiare. 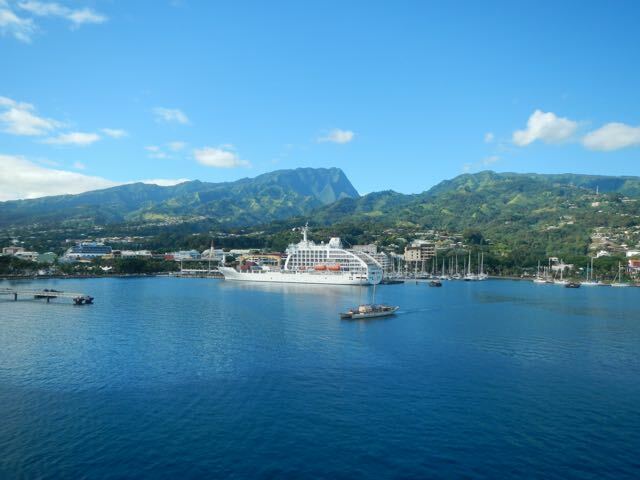 Moorea's north coast has excellent surf and a world-wide audience. 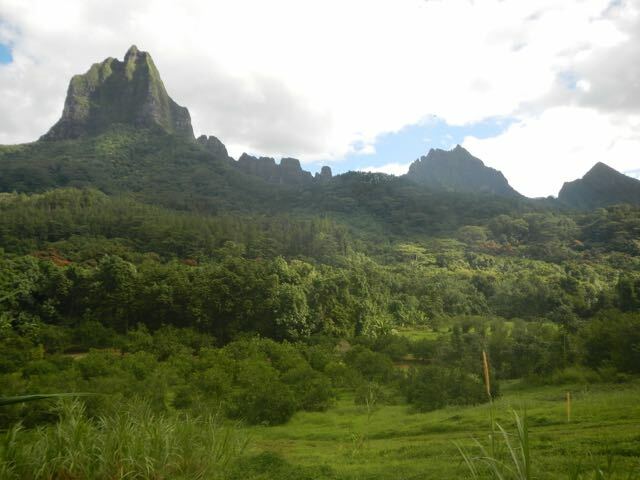 Some of the many spires that form the backbone of Moorea. They're very jagged but very soft basalt. The main road that circles the island runs along the shore, and just a few roads depart from it toward the ends of the larger valleys. The owner told us that it was a real cat. Lesson here? 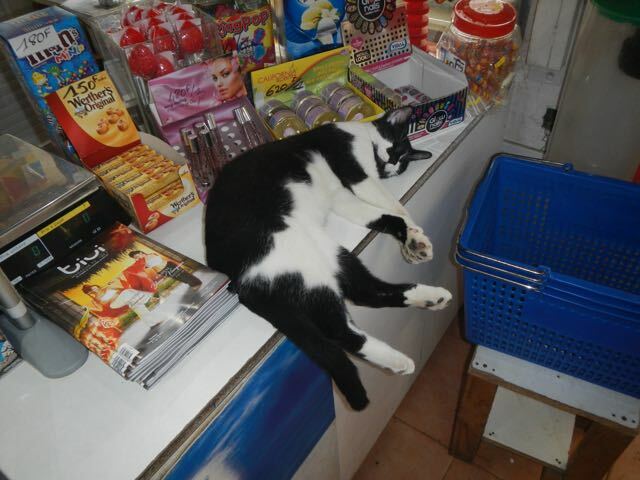 Cats are the same everywhere. We were buying a baguette, chevre, and Orangina for our traveling lunch. 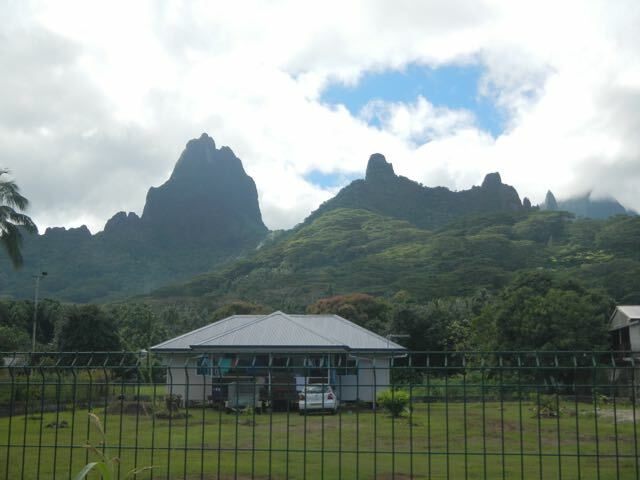 With a backdrop like this, it's probably the most photographed house on Moorea! Wow! 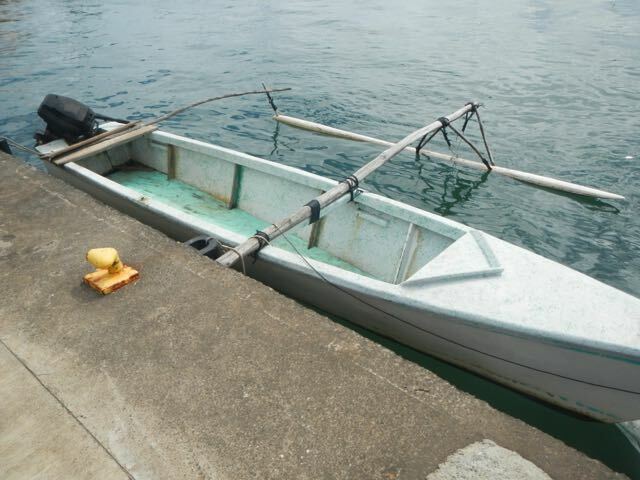 I took this photo to show the way this owner fabricated an outrigger for his fishing boat. Shoot, he just tied it on. Pomare III is the very nice young king who unceremoniously dumped his mother's bones from her crypt and kept it for himself. 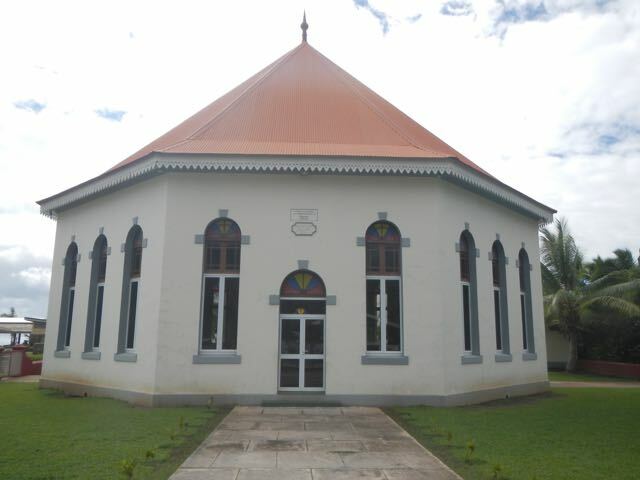 This is the oldest European building in the South Pacific, built by the London Missionary Society in Papetoai during the 1870s. 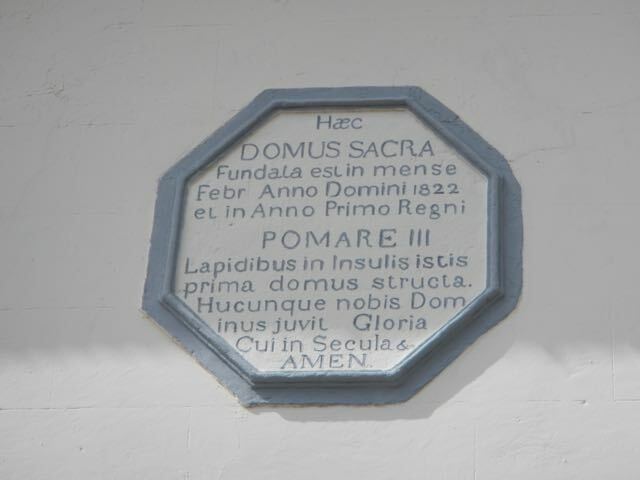 It's octagonal and much smaller than I thought that it would be, but for the times and resources, I'm sure that it was huge. 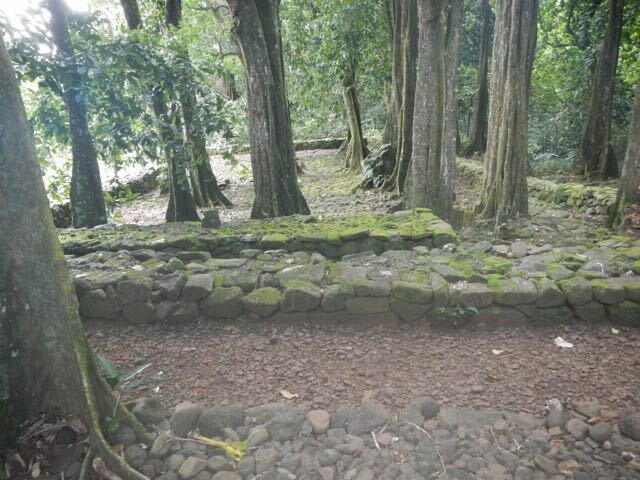 As was typical of all missionaries, the church was built over an old marae, a local "church" or holy center. Quite a message. 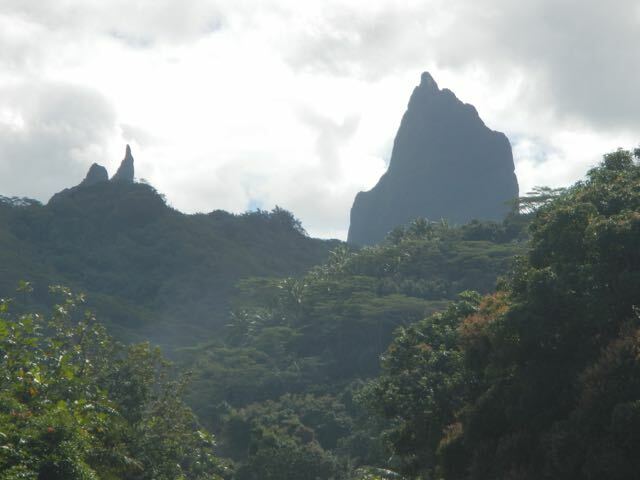 Just another scene of the incredibly jagged and omnipresent volcanic spires of Moorea. As you might guess, we were impressed. 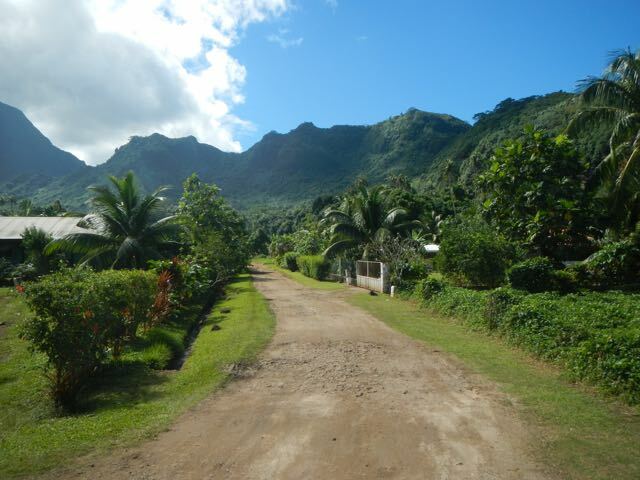 At Moorea's Experimental Agricultural Facility, we took a several-mile hike along some back roads. 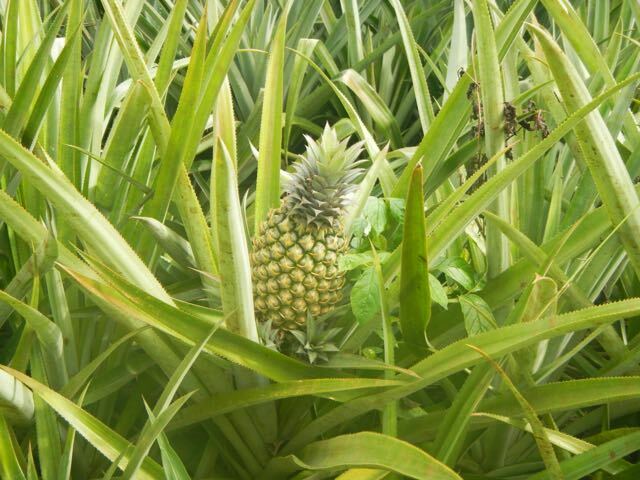 Moorea is known for her pineapple, and this field of pineapples is surrounded by THIS! What a setting! And here's one of the babies almost ready to harvest. Eggplant? it's some Solanum, to be sure, and using techniques that might be used anywhere. 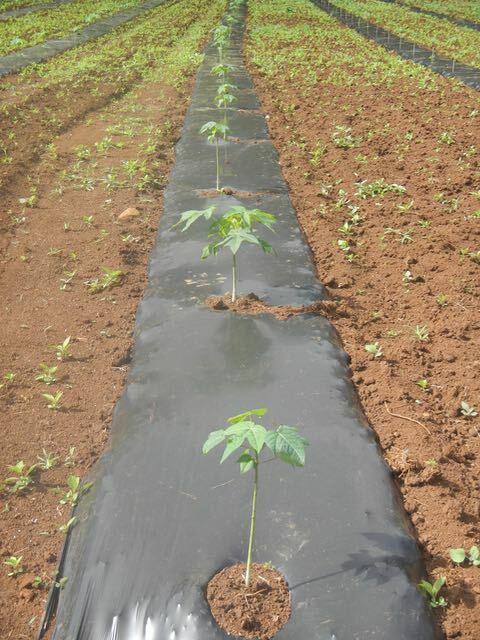 The red, volcanic soil is very fertile, as you can imagine. 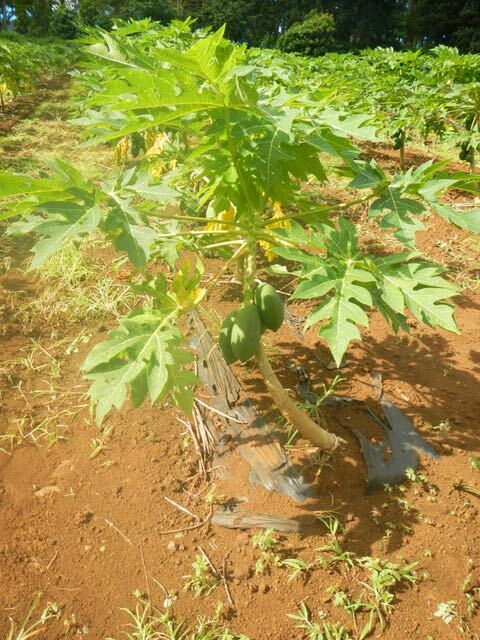 Papaya growing where they can be reached. Yeah, I know, more incredible scenery, but we were entranced by the setting of this facility. The hidden marae deep in the upper forests. There are centuries-old banyan trees growing in its center and when combined with the fact that there were human remains found in the walls, the mysterious-weirdness factor was off the charts. From the belvedere, or outlook, far up on the side of the caldera we could see Cook's Bay in the distance. On the other side of a prominence was Eupnoea Bay, in which we had spent several days. This enormous yacht is the MV Dragonfly. Pretty big boat, huh? Just too funny! This was on the sign at the ferry terminal. 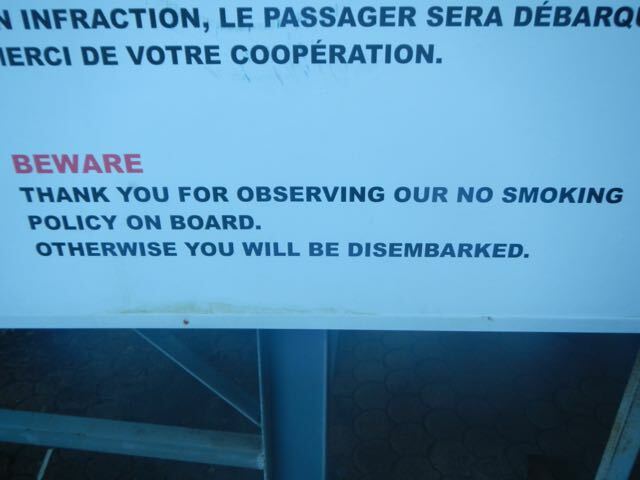 They'll "disembark" you? In mid-trip? 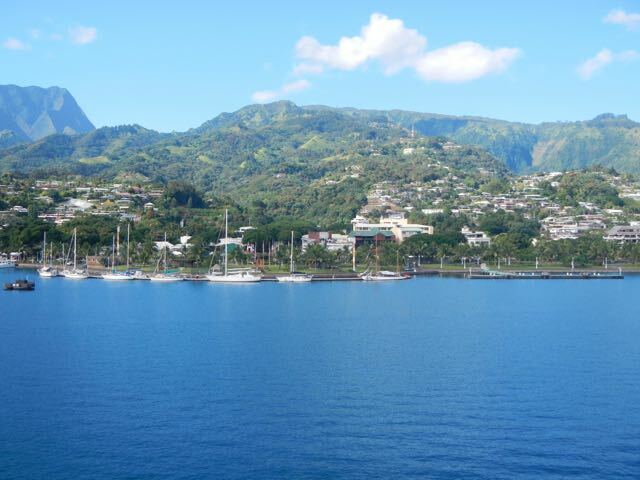 Conni and I break into our remaining food as we depart Moorea. Orangina is our favorite non-alcoholic drink, and we finished the baguette and chevre, too. 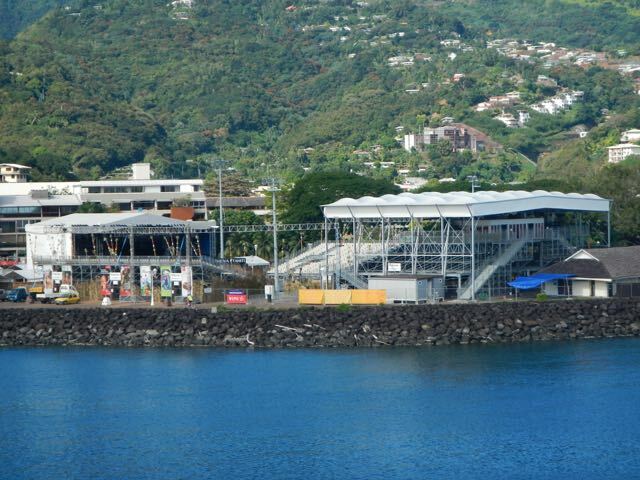 The marina has ONLY masts and is the Cook's Bay marina. Masts only in this marina. 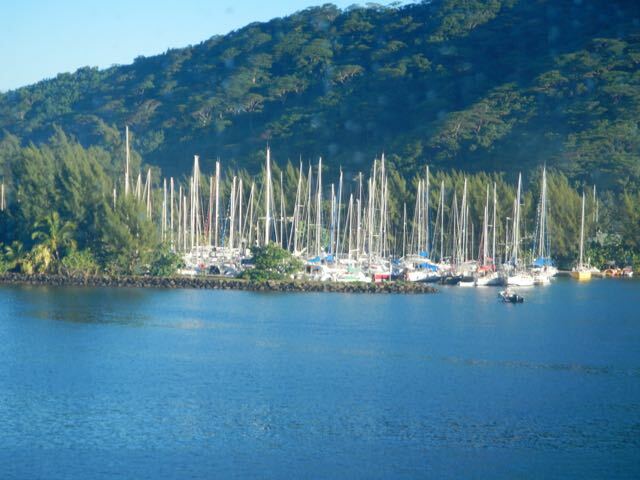 How different than most American marinas. 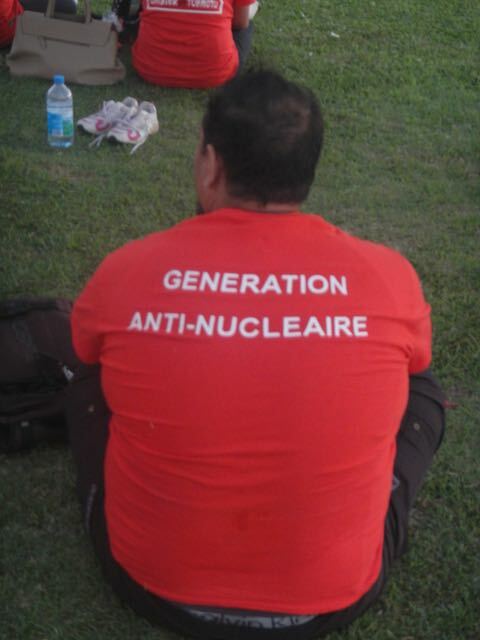 This shirt was worn by a participant at the anti-nuclear demonstration held on the 50th anniversary of the first French nuclear test in French Polynesia. They've not forgotten. 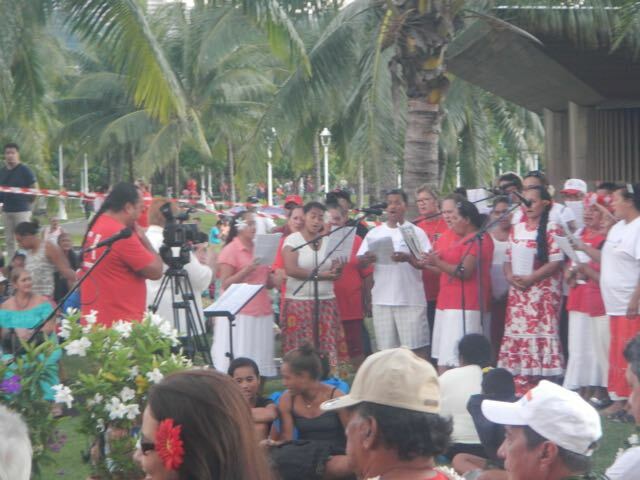 Choirs sing Tahitian songs, but of course we don't know Tahitian. The even was filmed for local TV.